Excavations at the Artesian Branch Site | Cultural Resource Analysts, Inc.
Artesian Branch was a large Late Woodland site investigated during the course of the AOS project. Located at the base of a north–south trending bluff along the western edge of the Mississippi floodplain, this site was occupied from approximately A.D. 600 to 1100/1200. Actually, the site was composed of two major habitation events, each in itself consisting of numerous re-occupations. The earlier of the two major occupations belonged to the South Branch cultural group and dated between A.D. 600 and 900. The later major occupation occurred between A.D. 900 and 1100/1200 and is very similar to the Tampico Variant as defined in west-central Illinois. For this post, I will focus on the former occupation as Artesian Branch represents the only South Branch site in Missouri that has been intensely investigated. Excavated South Branch pits consisted of a large number of deep earth ovens and shallow pit hearths that were used for cooking, as well as many deep pits that likely functioned as temporary storage for food. While evidence for shelters or houses was not present, numerous open circular areas not containing pits were observed. It is possible that some of these open areas may have had temporary shelters but were not substantial enough to survive in the archaeological record. In addition to pits, a large amount of pottery and lithic material was also recovered. South Branch pottery is very distinctive with most vessels exhibiting net-impression on the exterior surface. The technique of using nets to roughen the exterior surface of vessels is unique in this portion of the Mississippi River valley. On the exterior of the vessel, below the lip, decoration was often placed in the form of small circular punctates or bosses arranged in single or double rows. Frequently, decoration was also inscribed on the interior portion of the vessel lip with various types of stamps. Small-sized projectile points were also found among the various pits . Many of these points were used for hunting, but some likely functioned as knives also. Various sized celts or adzes used for wood working were also recovered. Lastly, a few personal adornment items were identified, including several cannel coal-like pendants. 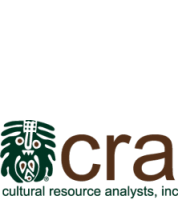 As a result of the work at Artesian Branch, CRA was able to better define the South Branch culture in this portion of Missouri. For example, we proposed that the South Branch sequence at AOS, which spans about 300 years, can be divided into an early and late phase. We called these South Branch I phase (A.D. 600–700) and South Branch II phase (A.D. 700–900), respectively. This definition was possible based on 13 AMS radiocarbon dates along with the upper rim and interior lip decoration found on the ceramic vessels. We were also able to determine that South Branch at Artesian Branch was actually numerous separate re-occupations by relatively small groups of people who lived at the site for short periods of time. In other words, there was few data to indicate that the South Branch habitation at Artesian Branch represented a sedentary village, but instead likely reflected the accumulation of living debris made by fairly mobile groups who visited the location several times a year for a few weeks or months at a time.